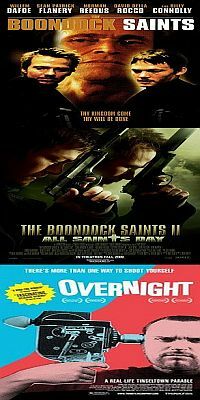 when the idea of doing a month’s worth of tarantino ripoffs came up, THE boondock saints was pretty high on the list. having avoided it for more than a decade, mostly because of the cult following, i couldn’t wait to finally watch and hate it. i didn’t, just apathetic. 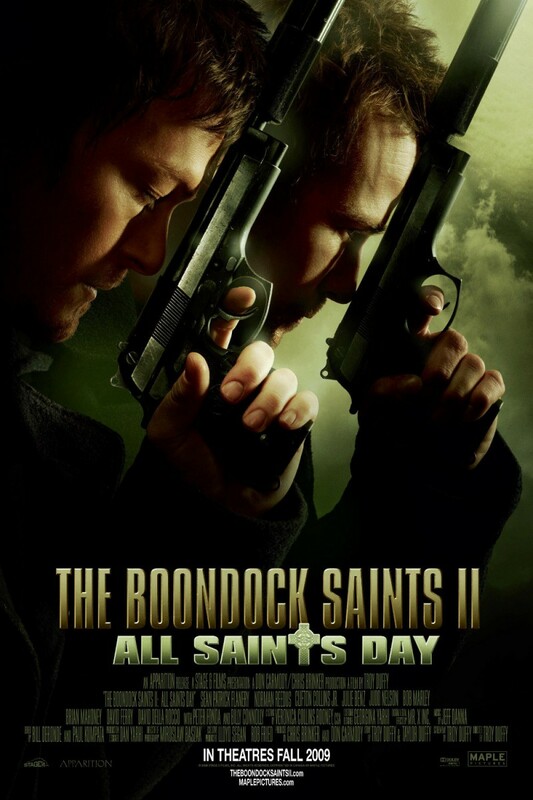 so we moved on to THE boondock saints ii: all saints day. despite all the bad and hilarious reviews, it’s worse but nothing worth wasting my hatred on. procrastination sets in once again and i thought overnight may provoke some sort of reaction in me, still, nothing. 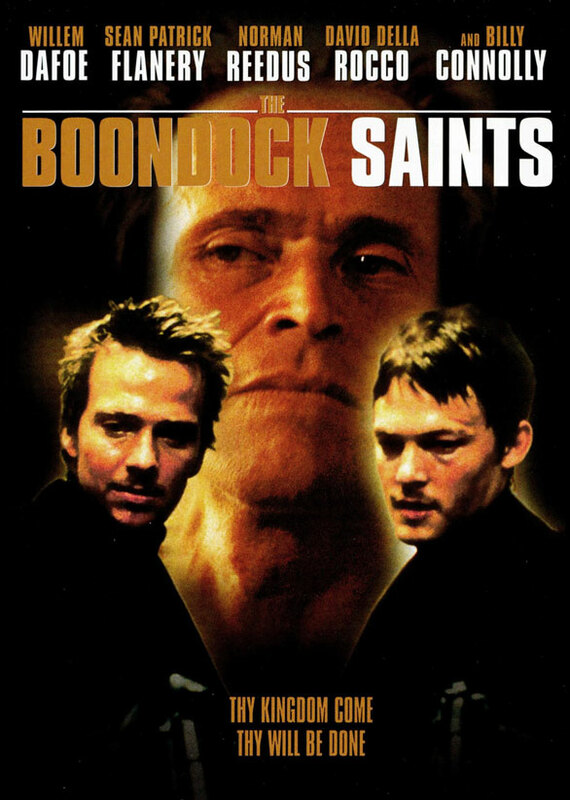 THE boondock i: the fellowship of the saints is about two american actors playing irish catholic brothers turn vigilante. despite what’s shown in the movie, and even though they have matching tattoos and wear matching jewelries, they are not lovers. with the amount of gay jokes in both pooncock movies, troy duffy sure loves showing the two “brothers” naked, wrestling and horsing around, and looking lovingly at each other. oh did i mention that in poontaints episode i the “twin brothers” worked as meatpackers? meatpackers who are great at fights and fiiiireeeefiiiights? anyway, they got in trouble with the russian mob when those damn commies tried to kick everyone out of the bar on st. patrick’s night, two minutes after the bar owner told them that he’s gonna lose his bar. the bar owner, played by fraggle rock’s gerard parkes, swears involuntarily because he has tourettes. it’s not really that important in regards to anything. see, in duffy’s world, people curising involuntarily is funny, repeatedly. it’s funny in 1999 and it’s funny in 2010.
that was sarcasm. only larry david can make tourettes funny. the russian mob plot, thankfully, brings in the best thing about THE B.S. 1: willem dafoe as nicolas cage/al pacino at their yelliest as a gay fbi agent. like a lot of scenes in the movie, his introduction is in slow motion. just to show you the level we’re dealing with here, dafoe listens to opera and eventually dresses up as a woman. all gay people are like that, in troy duffy’s world. there’s also the scottish comedian billy connolley(head of the class, the latter years) as the hannibal lector type badass, even though he can’t shoot three guys with six guns from the sidewalk to the porch. this is done way better in con air with the steve buscemi character. like tarantino, in addition to the casting of a 70s tv show actor, THE B.S. 1 jumbles up the timeline by having dafoe’s character figuring out what happened after the “brothers” deeds. it doesn’t make sense logically since at no point was dafoe’s agent as being a psychic as well. since it was made before all the c.s.i.s, it works most of the time, especially when he is on screen at the same time as the “brothers.” as an actor who’s been in both last temptation of christ and antichrist, dafoe deserves more suspensions of disbelief than the two bland “brothers.” sean patrick flanery should know better though, considering he was in suicide kings, the much more enjoyable tarantino ripoff. there’s also the marvin getting shot incident here but instead it’s a cat. it doesn’t get any more macho than that. THE B.S. 1 seems more like someone who watched tarantino’s works and some hong kong action movies and decided he can do it just as well, if not better. the action scenes are technically competent. there are tarantino elements in it, it seems more like a guy ritchie ripoff. it’s a copy of a copy of a copy. since he’s neither from boston nor does he seem catholic, the religious angle is more a ripoff of scorsese’s early works than anything autobiographical. i don’t get the juggalo-like cult following. i don’t know, maybe you have to be catholic, or from boston. but if i were catholic, i would be offended that the “brothers” were inspired to rid the world of evil by killing bad guys. first of all, the god told me to revelation looks like they were getting a shot to the face from the ceiling, complete with half nakedness. second, it’s scary to think that there are people out there who thinks that this is a great movie, actually buys into the “cool” things that duffy came up with. and i haven’t done any research on this but i’m pretty sure the word “firefight” entered the pop culture lexicon because of this movie. it works about as well as your typical decent direct-to-video action movie. the religious and social aspects are merely dressings. it is probably, and appropriately, the best blockbuster exclusive out there. i don’t know if it deserves to be the cult hit that it has become. it’s not bad enough to be good and it’s certainly not good. you can’t even really like it ironically. from what i remember, it’s around that time that hot topic went from joy division and siouxsie to korn and limp bizkit. must have been something in the air. ebert warns about battle: los angeles in his last paragraph, but i think THE B.S. 1 serves as a better limitus test. the more they like THE B.S. 1, the further you should stay away. THE B.S. 2: all saints day, duffy’s second movie after THE B.S. 1 received a larger theatrical release than the first one. filmed entirely in canada, the sequel opens in a rather uwe boll-like fashion, with the brothers and their father hiding out in ireland tending sheep and growing fake facial hair. they might have also time traveled to the 1500 a.d. but anyway, a priest ran to their irish-canadian farm, maybe all the way from north america, to inform them that a copycat has killed a priest in boston, THE B.S. 1 style, with pennies in eyes and all. three minutes of digging, packing, showering and shaving later, they look like they did in the first movie(well one of them did anyway. sean patrick flannery must be doing some mickey rouke style method-looking) and are heading back to boston, canada to find out who is trying to frame them for murder, cause you know, this time it’s personal. i don’t know how many cargo ships there are in a day that goes from ireland to boston, but the brothers happen to be on one that includes a mexican named romeo(clifton collins jr. from crank 2, mindhunters), who also happens to be a mixed martial artist. 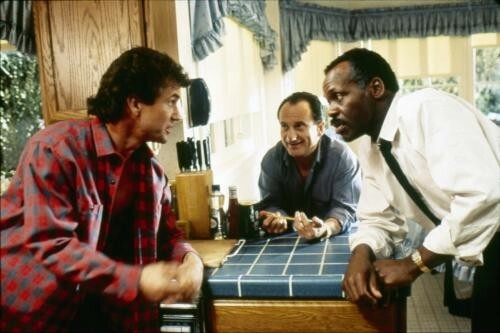 since the tri-kick died in the first movie, they got themselves a joe pesci. judd nelson channeling al pacino plays the son of the mafioso from the first movie, even though he looks about the same age. the fbi agent this time, instead of dafoe who saved the first movie, becomes a southern female agent played by julie benz(punisher iii, saw v, rambo iv, 8 mm 2, halo 2). there’s not really any reason why she’s southern. billy connolly is also back as the dad, to stare at inanimate objects to self induce flashbacks. THE B.S. 2 starts out at such a low point that yes, it does get better as it goes on. without the dafoe character, it is also feels more dead than the first movie. the two brothers are just as bland and tiresome as they were in the first movie, except maybe more juvenile. thinking that he figured out how to make sequels better, duffy changes minor details and repeats everything he did in the first movie with unnecessary, bloated, excessive, indulgence. there are basically two modes in any given scenes: junior high humor and guns being fired, with the saints 100% accuracy whatever position they are in and the dozen bad guys never hit anything, while in a stationary poition. having read some of the reviews of the second movie  , once again, i was excited to see how bad it is. while the opening was promising, the rest is mostly boring, with a few wtf moments. the action scenes are, like the first movie, competently shot. but everything else has been done to death that even d-t-v are not doing them anymore. shane black did that trying out one liner thing in 91. other movies homaged/ripped off here includes the godfather ii, die hard, kill bill vol. 2.
duffy also brought back other characters from the first movie. most notably, the sidekick guy who died in the first one, shows up here in a dream sequence that charlie sheen would be proud of). the ending doesn’t make much sense either, but by that point i was just happy that the movie was ending. i would go in to it but i don’t want to spoil the movie for you. honestly, i just want to forget that i watched it. between THE B.S. 1 and THE B.S. 2, there’s a documentary about troy duffy’s pre-filmmaking adventures. it’s called overnight, not because THE B.S. 1 was an overnight sensation, but because duffy himself was one, for less than two weeks. and this was before a single frame of the movie was shot. the story goes that harvey weinstein loves THE B.S. 1 script so much that miramax will pay duffy $300,000 for it and let him direct it. on top of that, weinstein will also have duffy’s band, the brood, do the soundtrack, including a record deal with madonna’s maverick records. THE B.S. 1 was going to have a $15 million budget. the two of them were also going to co-own a bar. based on the script, maybe weinstein thought he found the next tarantino and kevin smith in one bartending package. this is the beginning of the movie. it’s cinderella in reverse. made by duffy’s ex friends, most of overnight consists of duffy being an a-hole, or a douche, or sometimes both. we rarely see any footages of works being done. there are a lot of scenes of drinking and smoking, and duffy claiming how great he/his script/his music is. since the filmmakers were friends of duffy’s, overnight could have been seen as a slam/revenge piece. i don’t think anything were taken out of context or made up. duffy’s personality comes through clearly scene after scene. additionally, i don’t think duffy is to blame. overnight doesn’t really show us what happened to the movie and record deals. 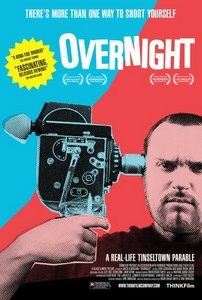 it may be the simple reason of access but here’s where overnight failed as an interesting documentary. it’s a series of repetitious scenes of duffy being, well himself. a more thorough investigative (third party) filmmaker might have got some answers regarding the falling through of the movie and record deals. (rumor has it that weinstein bought the duffy movie without ever intending to making it but simply to keep other studios, mainly new line cinema, where duffy’s friend works, from making it) regardless, overnight doesn’t affect your opinion on either of the pooncock movies, and that, i think, is where it fails. that’s just about enough troy duffy related disappointment for me in one lifetime. we’ll maybe talk and think about him again in ten years. this is in vern’s review, but it has to be seen to be believed. i could not make it all the way through.